Brace yourselves. Spring is coming! The 20th of March was the first day of spring, and the change of weather has been soooo nice. These warm days that we’ve been having in Philly has made me want to get outside! Even the flowers want to get out of the ground and enjoy the warmth—you can see trees budding and plants sprouting all over the place. 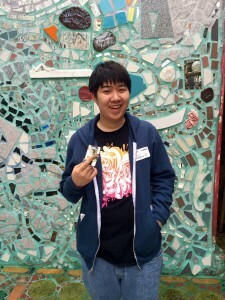 To prepare ourselves for the onslaught of color that will grace our dirt soon, we had a SEPTAdventure at Magic Gardens! 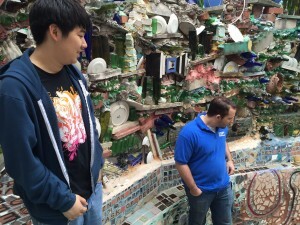 Magic Gardens is offering $2.00 off of admission for SEPTA pass holders! Tickets are regularly $10.00, so you will save 20% by bringing your monthly, weekly, or independence pass. This month we had three SEPTAteers– Dan, Victor and I. Dan took the Warminster Line from the Hatboro station to Jefferson Station, then took the 45 bus to South and 11th Street. Victor, coming from North Philly, took the Broad Street Line from the AT&T station to the Lombard South Station. I took the train from East Falls Station, part of the Manayunk/Norristown line, to Jefferson Station. I then took the 45 bus to South and 11th Street as Dan did. nestled in South Street. Check it out! 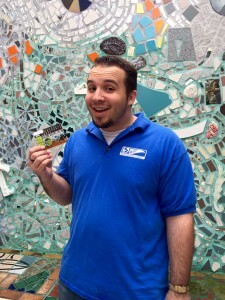 And bring your eligible SEPTA pass to get there and get a sweet discount!